Prosecutors say he tried to extort more than $20m (£15m) from Nike, threatening to use his profile to inflict reputational harm on the firm. Mr Avenatti has denied attempting to extort Nike. "We never attempted to extort Nike & when the evidence is disclosed, the public will learn the truth about Nike's crime & coverup," Mr Avenatti tweeted. He has not commented on the other allegations. At one point he said he was considering running for president himself in 2020. Outside court, he said he was confident he would be "fully exonerated". He told reporters he had spent his career fighting powerful people and powerful corporations and that he would "never stop fighting that good fight". Mr Avenatti reportedly threatened to take $10bn (£7.56bn) off Nike's market value. "A suit and tie does not mask the fact that, at its core, this was an old-fashioned shakedown," said prosecutor Geoffrey Berman told reporters. Nike said in a statement it would "not be extorted or hide information that is relevant to a government investigation". 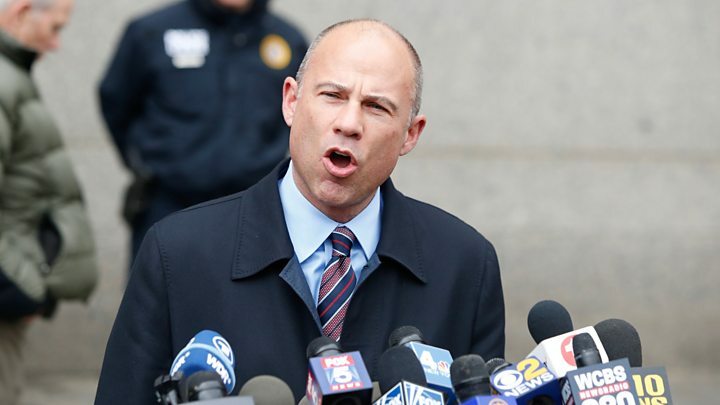 Los Angeles prosecutor Nick Hanna said Mr Avenatti describes himself as an "attorney, advocate and fighter for good" on social media, while in fact he "fights for his own selfish interests". Prosecutors say that he negotiated a $1.6m settlement for a client, but only gave them a "bogus" agreement with a false payment date. He allegedly then collected the settlement in secret and "advanced" $130,000 to his client, using the rest to support his "lavish lifestyle". On Saturday, he tweeted that the president should be indicted for colluding with his former lawyer "to violate the law and commit crimes." Ms Daniels, in a tweet, said on Monday that she had terminated Mr Avenatti's contract "more than a month ago... after discovering that he had dealt with me extremely dishonestly". "Knowing what I know now about Michael, I'm saddened but not shocked regarding his arrest."